Looks like a BUNCH of people have signed up to tackle Whole 30!!! A few people are delaying their start, setting themselves up for success. So… please feel free to sign up, if you haven’t! One of the most challenging parts of Whole 30 is breakfast. Some people get to the point of, “If I see one. more. egg…” If that’s you, check out this link. There are a bunch of ways to make eggs a little different, and there are also a bunch of eggless recipes! Hooray!!! But if you’re like me, you NEVER get tired of eggs! My favorite is to make a huge frittata and keep it in the fridge. I saute veggies, shredded sweet potato, and ground pork with tons of seasoning. Then, I add as many scrambled eggs as possible!! 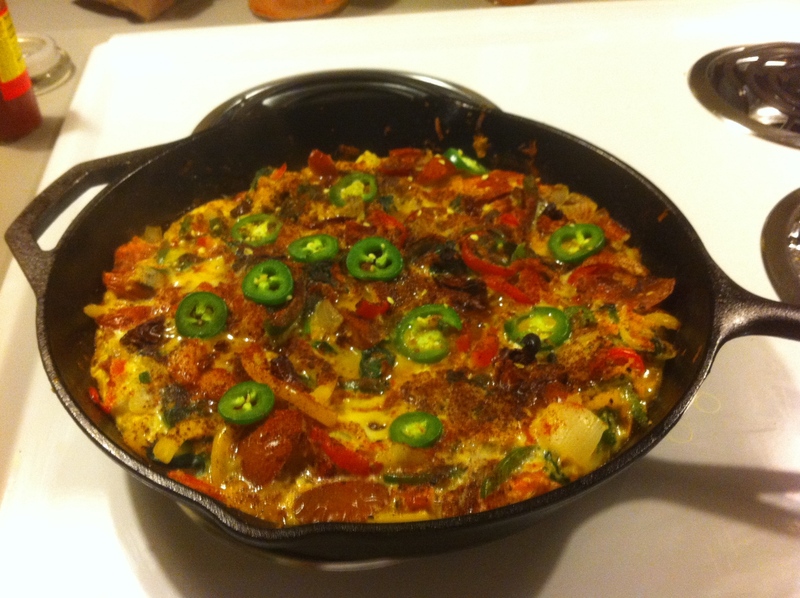 (My record is 18 eggs) I usually top with tomato slices, but I go with fresh jalapenos if I’m feeling SPICY!! Cook on the stove for about 10 minutes and finish in a 350 degree oven. DELISH! Check out this article from Whole 9 for other great eggy ideas. It’s time for another squat test!! Accumulate 10 minutes in a squat to improve your hip and ankle flexibility. Take breaks to shake it out when needed. Here’s K-Star’s second squat test video. Watch from the beginning for a good shoulder mobilization! Click here for Saturday’s WOD.